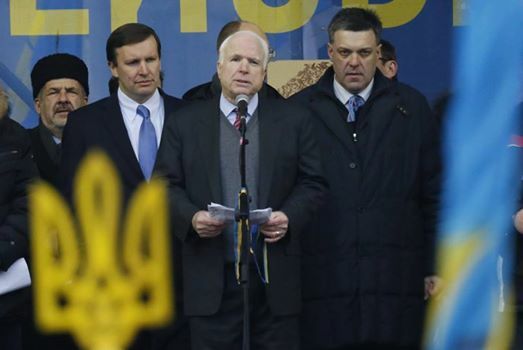 In the Ukraine crisis, U.S. and European politicians and media have relentlessly condemned Russia for violations of international standards, particularly Moscow’s acceptance of Crimea’s hasty vote to secede from Ukraine and rejoin Russia. 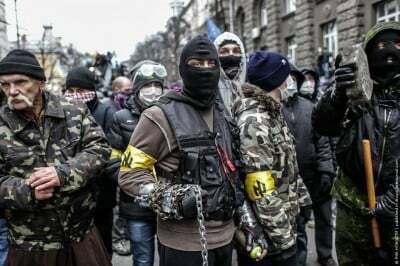 But the West has gone nearly silent regarding Kiev’s violation of rules for controlling armed militias, including neo-Nazi forces. For instance, the Organization for Security and Cooperation in Europe, which has harshly criticized Russia’s annexation of Crimea, has refrained from similar outrage over Ukraine’s unleashing of extremist militias that have inflicted extensive bloodshed and abuse on ethnic Russians in rebellious eastern Ukraine. Yet, Ukraine has intentionally dispatched far-right militias, some waving neo-Nazi banners, to attack towns and cities in eastern Ukraine. Though this reality has drawn spotty recognition even in the Western media, there has been little criticism of the Kiev regime for these tactics. 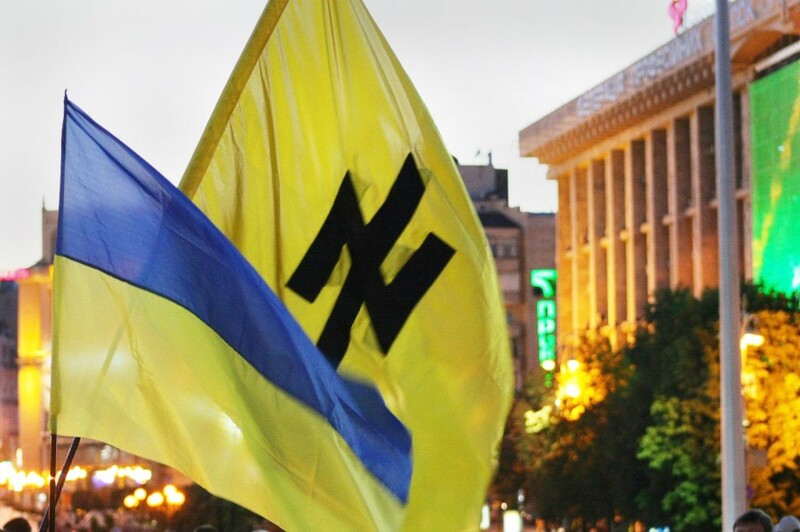 Instead the typical response – especially from U.S. officialdom and media – has been to dismiss claims about the close association between the Ukrainian government and neo-Nazi extremists as “Russian propaganda.” That denial has held even as accounts of neo-Nazi militias have popped up in publications as hostile to Moscow as the New York Times, the London Telegraph and Foreign Policy. Image: Sen. John McCain appearing with Ukrainian rightists of the Svoboda party at a pre-coup rally in Kiev. An Aug. 10 article in the New York Times mentioned the neo-Nazi paramilitary role at the end of a long story on another topic. If you plowed through the story to the last three paragraphs, you would discover the remarkable fact that Nazi storm troopers were attacking a European population for the first time since World War II and that these neo-Nazi militias were largely out of control. The West’s silence about this inconvenient truth is especially startling because it should come as no surprise to the European Union, which has long been aware of the extremist positions held by the Svoboda party, which emerged as a major political force in Ukraine after the Feb. 22 coup ousting elected President Viktor Yanukovych. In December 2012, barely a year before the coup, the European Parliament expressed concern about “the rising nationalistic sentiment in Ukraine” represented by Svoboda, whose founders included admirers of World War II Nazi collaborators, such as Stepan Bandera and Adolf Hitler’s Ukrainian auxiliary, the Galician SS. A parliamentary statement from Brussels noted “that racist, anti-Semitic and xenophobic views go against the EU’s fundamental values and principles” and urged “pro-democratic parties” in Ukraine’s parliament “not to associate with, endorse or form coalitions with” Svoboda. After the coup, which was strongly supported by Svoboda and spearheaded by its associated neo-Nazi militias from the west, Svoboda and other far-right political groups were given several ministries in recognition of their crucial role in the anti-Yanukovych putsch. Now with Svoboda at the center of power in Kiev, the EU has muted its alarm, all the better to maintain the white hat/black hat scenario favored by Official Washington and the mainstream U.S. media. That narrative portrays the Kiev regime as the blameless white hats and Russia’s President Vladimir Putin and the ethnic Russian rebels in the east as the evil black hats. Besides the fascist leanings of some Ukrainian militias, there is also the issue of their brutality. On Monday, Amnesty International issued a report condemning abuses committed by Kiev’s Aidar militia against civilians north of the rebel-held city of Luhansk. the Amnesty International report said. “Our findings indicate that, while formally operating under the command of the Ukrainian security forces combined headquarters in the region members of the Aidar battalion act with virtually no oversight or control, and local police are either unwilling or unable to address the abuses. In other words, evidence is mounting that the Kiev regime has waged its so-called “anti-terrorist operation” against ethnic Russians in eastern Ukraine by using out-of-control paramilitaries, some guided by Nazi ideology. This behavior, fitting with the far-right political extremism previously known to EU leaders, also violates norms agreed to by the Ukrainian government in its commitment to the OSCE. Yet, apparently for geopolitical reasons, the Obama administration, the EU and the OSCE have muted any criticism. This silent hypocrisy has been largely echoed in the Western mainstream media.